On this exciting day tour, you'll journey to Quebec City, one of the oldest cities in North America. Stop at Capital Observatory and explore Quebec City and the Petit Champlain, the oldest commercial street in North America. After lunch, head to Montmorency Falls, where you'll get to the top of the falls to admire the beauty and the magnificence of the St-Lawrence River and its surrounding areas. After departing Montreal at 7:00am, take a 3-hour drive to Quebec City, one of the oldest cities in North America. You'll first stop at Capital Observatory, the tallest building in the city. The 31-story high observation deck offers 360-degree panoramic views of the capital. Then after, you'll have free time to visit the old Quebec City. As the only fortified city in North America, Quebec City has a history of more than 400 years. 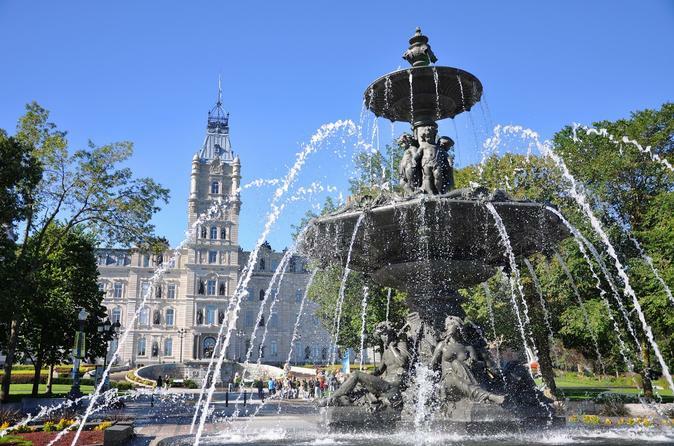 Discover Quebec City from many different angles: politics, military, history, heritage, architecture and so much more. Then take the chance to explore the Petit Champlain, the oldest commercial street in North America. Following lunch (not included), head to the Montmorency Falls. Standing at 83 meters high, it is the largest waterfall in the Province of Quebec. You will get to the top of the falls to admire the beauty and the magnificence of the St-Lawrence River and its surrounding areas. You will leave Quebec City and arrive in Montreal around 7:00pm.